Mr. Trotman made the announcement to stakeholders at a capacity-building symposium for the Guyana Extractive Industries Transparency Initiative (GEITI), at the Pegasus Hotel, Kingston, Georgetown today. “Government has received an application for a production license to be issued to ExxonMobil. We are finalising that process, and will be making some pronouncements in the next few weeks,” he said, according to a GINA/DPI statement. The existing contract is a 50-50 partnership Production Sharing Agreement (PSA). Exxon and its partners will be allowed to recover the cost invested in the offshore production before the equal sharing of the profit oil. The government had undertaken a review of the contract which dates back to 1999. Minister Trotman had indicated that the review was to update the contract since a number of factors would have changed since the period during which the document was signed. At the time, he was speaking at a forum held at the Umana Yana, in Georgetown, Guyana. 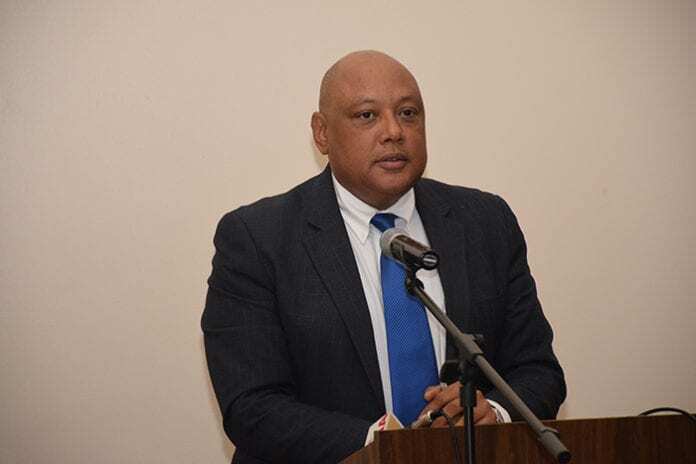 “Government is considering how and when and to what degree (details of the profit sharing agreement would be released) and we of course have to work with Exxon,” Mr. Trotman had said. Today, Minister Trotman noted that signing onto initiatives like the EITI standard is part of building trust and better relationships as the country develops its oil and gas sector. “I know there is a natural suspicion that governments are always up to something bad, something suspicious, (and) something that is unholy and unhealthy. But it is comforting to know that government has partners in both the industry and civil society to hold its hand, to hold their hands, so that together we can develop our resources in the best possible manner,” he said. EITI is an international standard that seeks to provide consolidated information on a country’s extractive sector. It aims to reconcile key revenue flows paid by companies with those received by government and assesses how the revenues are expended on behalf of the people. Guyana is hoping to become part of the EITI by year end.